Know how you feel. And after all that company. Still, risotto and a vat of wine do it for me too. Well, maybe not a vat, but a large glass or three is good. Love the fennel and hazelnuts. i will have to try this. it sounds lovely to warm up any soul! If anything cen do it, it’s risotto…and the wine of course! Rosie looked like she was splendid company! Anh – Thank you! Don’t normally mind living alone. Think it was just the contrast of lots of company then none. Must have been the same when your family’s holiday was over. Johanna – It did cheer me up! Love the slight crunch of the hazlenut in the risotto. Oh Wendy how rotten! Just heartbreaking. But good for you pushing your feelings down with food and wine like a true chef! hehe. This looks incredible – I love the crunch of the hazelnuts through the whole thing. Now you must tell me, which wine did you choose to go with your risotto. It looks like a red ????? Was it your favorite Penfolds??? Man, I was just at Amanda’s blog where she was talking about cassoulet, and now you are talking about comfort food – I really think there must be something in the air! Amanda – The crunch is my favourite part too! Jenn – Really? Think they are my favourite nut. Well, after Brazil nuts. Oh, and pistachio.. And.. Nah. Love them all! 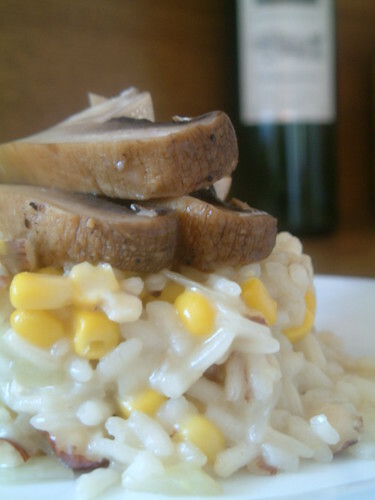 It’s been ages since I last made risotto, Wendy, and you’ve just inspired me – this is delicious! Oh Wendy, I know that feeling of an empty house. It won’t be long before D gets back. This risotto looks very comforting. I’m a meat easter but I like the idea of mushrooms. Your mushrooms looks nice and juicy. Yes, it’s really rare to find hazelnuts in every day food here! So weird. They call them fillberts or filberts or something. I’ve never met a risotto I didn’t like. This one I really like. Love. Adore. Cherish. Esteem. You get the point. Hope you’re feeing more spirited soon. Patricia – Hope you enjoy it. I’m a risotto addict! Nora – I’m a meat eater too. Just fancied a mushroom! Will definitely be trying it again soon with some lamb or venison. Amanda – Just saying “filbert” makes me laugh. It sounds like the Ned Flanders of nuts! Wow, this sounds great. I’ll have to try a hazelnut risotto next time. Wendy, thanks for this delicious recipe and mouthwatering photo! We are proud to have them both included in this week’s FoodieView Recipe Roundup!! !